What means to be mindful? In the first lesson the children learn how the brain works, how it can change and grow and why paying attention to the present moment can be of benefit to them. The practice of bringing the attention back to the present moment. In the lesson children learn about attention, which is the key to our experience and how mind tends to wander. With very short breathing techniques they also begin training their attention to be present. This is the way we pay attention to everything around us. The children learn the value of non-reactivity; the beginner’s mind and how to develop their willpower and diligence. 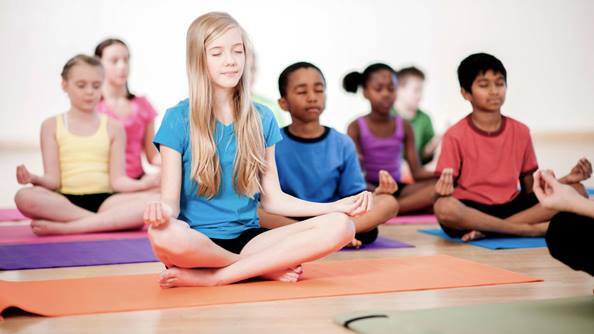 Mindful awareness exercises help children develop concentration and self-awareness. Children are guided through an experience of paying attention to sounds. After some practice, children may find this exercise to be helpful in their daily lives – before doing homework, when they are having difficulty settling down at bedtime or at other any other time when it would be useful to settle the mind. For concentration to improve you need your child to be able to restrict both the mind and body. How we are handling difficult emotions, thoughts and mind-states with wisdom, courage and awareness. We will explore the natural reaction to turn away from difficulty and instead cultivate the capacity to “be-with” the difficult. The children are exploring the idea that thoughts are not facts. After becoming quite familiar with their own minds children are ready to begin cultivating an attitude of kindness and warmth towards themselves. What is meant by kindness conceptually, and also how we can be kind to ourselves in practical ways. Everybody wants to be happy and nobody wants to suffer! The children then practice kindness towards others, beginning with friends and extending the practice to classmates and others. They will have the opportunity to engage in acts of kindness. Children reflect on all they have learned over the course. After every session they write an addition to the personal mission statement. The statement will be ready at this point in the course, how they can integrate their learning and acting in a way they can be proud of. Printable, guided meditation and homework challenges will be provided as a part of the course. Children are spending a lot of time at school sitting behind desks and being asked to be still. This at a time when they are biologically programmed to move, explore and adventure into the world. Mindful movement is a great way to release some of this energy. Very often the children are very happy to be still after moving a lot. What’s more, mindful movement offers new avenues for the children. This is the way to deepen their understanding and application of mindfulness in daily life. Download EBook ” A Letter From the Brain”. A simple explanation of how the brain works and where our emotion are coming from! Mindfulness is not something you can make somebody do. For mindfulness to be mindfulness it has to come from within. If children are to be mindful, they have to decide of their own volition to bring their mind to the present moment and practise being aware of what is happening. As such it is crucial to engage children and for them to decide that mindfulness is something they want to do. If it’s boring they simply won’t engage, so the most powerful way to do this is to make it fun and interesting! The Kids Programme will be packed with fun. Children will do activities, games, all designed to illustrate different aspects of mindfulness and encourage the children’s engagement.